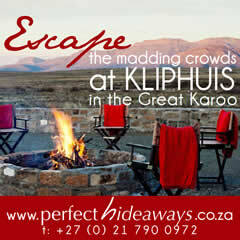 Ladismith (550m) nestles at the foot of the Klein Swartberg mountain range in the Klein Karoo. It is linked by tarred main roads to all major centres, including Cape Town (320km), Oudtshoorn (100km), Montagu (139km), George (160km), Mossel Bay (185km) and Port Elizabeth (420km). An impressive mountain peak called Towerkop (2198m) looms above Ladismith. Local legend has it that a witch, flying overhead, struck the peak in anger with her wand because it obstructed her passage over the mountain. Her anger resulted in Towerkop's unique appearance - the peak is split in two. Halfway up Elandsberg (2128m) you'll find a famous landmark, sometimes referred to as Ladismith's extra star in the galaxy: Stanley's Light (1500m). Erected in 1963 by Stanley de Wit, an inhabitant of the town, it consisted of a bicycle lamp and dynamo being powered by a waterstream. An indication of the availability of water for the surrounding farms and the town itself was hereby established. 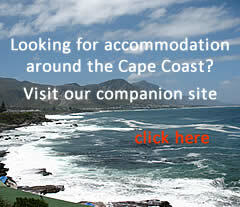 A wide variety of scenic routes are accessible from Ladismith. If one travels east through the beautiful Hoeko Valley, breathtaking views of orchards in the spring and autumn can be experienced. Turning into the Seweweekspoort pass, spectacular rock formations can be seen as the road follows the winding riverbed for 21km through the moun tains and emerges in the Great Karoo.Travelling west of Ladismith one can visit the picturesque valleys, with the orchards, vineyards and old farmhouses of Dwarsrivier, Voorbaat and Van Zylsdamme. It serves an extensive farming area with ideal climate for the production of apricots,peaches,plums, nectarines, and grapes. Approximately 30% of the total apricot export market comes from the district . There are two cheese factories as well as a winery. Ladismith is unique in the sense that is has its own individual building style. The so-called Ladismith style is a simplified Georgian design and dates from the 1830's. Several other architectural styles, i.e. Neo-Gothic, Georgian, Victorian, Regency and Rural (Karoo) style, can also be found.